The Indo Canada Chamber of Commerce is holding its 8th Annual Cricket Tournament at Brampton, Ontario, on Monday August 3rd. A day known locally as the Civic Holiday, or Simcoe Day (in honour of the former Upper Canada Lt Governor who set the ball rolling on steps against slavery in Upper Canada, now Ontario). The event is at the Creditview Grounds, which are at 10,530 Creditview Road, Brampton. The nearest major intersection is Creditview Road and Sandalwood Parkway. Various entertainments and food will be at the ground, in addition to the cricket. A $10 entrance fee exists for spectators. The participating teams include various folks from the financial world and some dignitiaries will be on hand, some may even play. The Indo Canada Chamber of Commerce (ICCC) President's XI heads the participants, together with an RBC (Royal Bank of Canada) XI, Scotiabank XI, State Bank of India XI, Deloitte XI and ICCC Young Professionals XI. ** Note: In the community event listings of one of the various GTA Ethnic newspapers last week, the venue was given as Eglinton Flats, Toronto. A report in this week's "South Asian Focus" (July 30) states the ground as being Creditview, and this is confirmed by details on the ICCC website. Cricket Alberta, in its efforts to develop Alberta's elite players, is proud to announce that it will be hosting Australia's National Team fielding coach, Mike Young, from August 11 to 14, 2009. Mike's impressive career boasts nine years as Australia's National Team fielding coach during which time he has incorporated his extensive baseball coaching experience into his cricket career. This masterful fusion has improved Australia's fielding techniques dramatically. We hope to take advantage of Mike's expertise in Alberta, and provide this once in a lifetime opportunity to our fellow cricketers across the country. Much like a bowler fooling the batsman with a wicked "googly," Deepal Peiris uses the game of cricket as bait. Sure, there's going to be an 18-team, six-a-side cricket tournament starting 10 a.m. at Lucas secondary school on Saturday, followed by a dinner and dance at the Croatian banquet hall at 7:30 p.m. But that's not the end game. "It's not about the cricket," said Peiris of Cyberteks Design website fame, who's the tourney organizer and president of the Canada Sri Lanka Association of London. "It's about bringing people together. That's the biggest thing -- to have different cultures come together. Though the familiar white clothing of the cricketeers will be visible all day on the football field and two soccer pitches at Lucas, Peiris is aiming for more. The championship trophies have been donated by hockey's London Knights. As well, London's Chinese, Greek, Italian, German, Portuguese, Dutch, Indian, Pakistani and West Indian community clubs have been invited to take part. Peiris' organizing committee involves the entire multicultural spectrum and his sponsorship list includes several businesses for which cricket is a foreign pastime. "The older people play cricket," Peiris said, "so let them come and take part. But if we could add soccer to this in the coming years, that would be great. You have cricket and soccer, you have two of the most popular sports in the whole world covered. "And it's important to involve the Knights and minor hockey. We want to get the young people, especially in the ethnic community, introduced to hockey, talking about hockey. We want everyone to be a part of what the young kids are playing." The opening ceremony will is at 9:15 a.m. at Lucas. London Mayor Anne Marie DeCicco-Best is the guest of honour. The dinner-dance emcee is John Davidson, founder of Jesse's Journey. Live music will be provided by Toronto Sri Lankan group Blue Alienz. "I think this day has a lot of potential," Peiris said. And cricket, so unappreciated in this country, could be the springboard. Opening ceremonies: 9:15 a.m. at Lucas. Kenya’s second round of the four-day International Cricket Council Intercontinental Cup match against Canada in Toronto has been postponed. The Cricket Kenya chief executive officer, Tom Tikolo, on Tuesday said that the event which had been set to start on August 7 has been pushed forward for a week. He said that the CK’s selection sub-committee will meet next week to pick the side to represent the country in Canada and that those selected will leave for Toronto on August 11. The CK chairman, Samir Inamdar, has said that the assistant team coach, Martin Suji, will handle the side during the tour as the coach to succeed Andy Kirsten, is likely to takeover in September. Suji is currently working with the boys who resumed training a week ago. He was left behind when the side toured Ireland in June for their opening game of the same tournament where they drew in the four-day game but were whitewashed 3-0 in the one day international series. The South African born Kirsten returned home on Saturday after CK declined to renew his contract. Inamdar said that they intend to invite the five coaches who have been short listed for the job to Nairobi for one on one interviews in August. Canada will be looking to repeat the 2006 win over Kenya in the ICC Intercontinental Cup, but to improve on the two home 2006 ODI losses, when the African nation visits the Greater Toronto Area (GTA) in early August. Kenya will play Canada in a first-class, ICC Intercontinental Cup match at Maple Leaf Cricket Club, King City, Ontario. The game is scheduled from Friday August 7 thru Monday August 10. Three ODI matches follow on August 12, 14 and 16, also at the Maple Leaf grounds. The grounds are located at the intersection of Dufferin Street and 15th Sideroad. The aim of the first-class Intercontinental Cup matches is for top players from leading ICC Associate countries, such as Canada and Kenya, to develop skills in the longer form of the game. Each team has two innings and there is a need to bowl the other team out. In limited overs cricket, an innings is automatically closed when the specified number of overs, usually 50 or 20 overs per side is reached. Canada pulled off an exciting 25-run win in the 2006 IC Cup game at Maple Leaf in a game of seesawing fortunes, but Canada’s October 2007 trip to Nairobi saw Kenya waltz home in the IC Cup by nine wickets in just three days. The 2009-2010 IC Cup began in July. Canada lost to Scotland by 29 runs in Aberdeen, but came close to a winning a match that ended as a draw against the Netherlands. Kenya drew its opening IC Cup match with Ireland. The senior international schedule for this season was dependent upon the outcome of the ICC World Cup Qualifier, held in South Africa in April. Canada came second, behind Ireland, so retained the High Performance ranking that kept Canada in the Intercontinental Cup, retained ODI status, and captured a place in the 2011 ICC Cricket World Cup. This was a really important achievement for Canadian cricket. Canada began its 2009-2010 Intercontinental Cup program with a 29 run loss to Scotland in Aberdeen, before a combination of last day rain and a fine unbeaten innings of 98 by Daan van Bunge saw the Netherlands hold on for a draw in Rotterdam. The Dutch were on 233 for 8 wickets when the game ended, with just two wickets remaining and well short of the victory target of 368 runs. Canada’s Sunil Dhaniram, a former Guyana player, made a career best 144 against the Dutch. His previous best was an unbeaten (141) against the UAE in 2007 at Maple Leaf CC. Canada split a two game ODI series with Scotland, Sandeep Jyoti scoring his first ODI century in Canada's six wicket win, making 117, and Ashish Bagai made 92 not out. Sunil Dhaniram hit 92, but Scotland won by 5 wickets in the second match. One ODI against the Netherlands was washed out, the Dutch won the other game by 50 runs, despite a valliant 94 from Canada's Rizwan Cheema. In July, Kenya drew with Ireland in the Intercontinental Cup but lost an ODI series to Ireland 3-0. All-rounder Collins Obuya showed form with 78 not out in the third ODI game, and captain Morris Ouma made 61. Alex Obanda struck 59 and 41 in the last two ODS’s. Pace bowler Thomas Odoyo took 4 wickets for 33 in the series opener. Canada then beat Bermuda at King City, then lost to the Netherlands (Dec 2006, Pretoria, South Africa. Canada won its Qualifying Group, but lost to Ireland in the 2006 ICC Intercontinental Cup Final at Grace Road, Leicester, England. Final played in May 2007.
and Sierra Leone (Africa); Canada and USA (Americas); Hong Kong and Afghanistan (Asia); Papua New Guinea and Vanuatu (East Asia-Pacific); Ireland and the Netherlands (Europe). and the ten ICC Full Member countries in the ICC Under-19 Cricket World Cup being staged in New Zealand next year. Canada is scheduled to host the actual 2012 Under-19 Cricket World Cup. Kenya had been scheduled to host next year's tournament. This year's Global Qualifier runs from September 1 thru September 13 in the Greater Toronto Area (GTA).A Maple Leaf CC (King City), Toronto Cricket Skating and Curling Club, Malton CC (Mississauga) and Ajax have been mentioned as potential grounds for these matches. Grass wickets at the Toronto club have supported ODIs since the mid-1990's Sahara Cup series between India and Pakistan.A Several grass wickets in the GTA were prepared for the 2001 ICC Trophy, but lack of ongoing maintenance saw the demise of many of the pitches. The underlying base, from the original work, allows for wickets to be restored, but this takes time, dedication and money. The short growing season can be an adverse factor in pitch restoration. Grass wickets restored during 2006 at Toronto's G. Ross Lord Park, originally to assist Canadian national team practices, were, sadly, worn out by the start of the 2008 domestic cricket season. The selection of Canadian Under-19 all-rounder Hiral Patel as first overall draft pick by the Chiefs, ahead of the powerful batting of Rizwan Cheema, was the headline news in the inaugural draft for Canada’s new TJT National Cricket League. Ugandan all-rounder Kenneth Kamyuka was third overall, chosen by the Kings in Thursday night’s draft. The first round was completed by the selections of Kenneth Wong (Warriors), Damoudar Daesrath (Titans) and Dhanuka Pathirana (Royals). Umar Bhatti, who captained Canada in the recent ICC Intercontinental Cup matches against Scotland and the Netherlands, was the second round selection of the Gladiators. Cheema became a crowd favourite with his powerful hitting for Canada in last year’s Scotiabank Series ODI’s, especially against the West Indies, and the Canadian Thanksgiving Al Barakah T20 tournament. He also is a useful medium pace bowler. He was interviewed by City TV before the draft, but Patel was, in many people’s opinion, the surprise top choice. Patel’s strong performance as a right hand opening batsman and left-arm spin bowler saw Canada Under-19’s to top spot in the recent ICC Americas Under-19 Championship. Interestingly, the draft’s second round began with Canadian Under-19 captain Rustam Bhatti, a wicketkeeper/batsman, being picked by the Royals. Patel said “he knew he was under consideration” as a leading choice, but he admitted it was “a little bit of a surprise.” The draft came hot on the trail of Patel winning Player of the Tournament and Best Batsman awards in the ICC Americas Under-19 Championships. Kamyuka is in his second year of playing for Brampton Masters Parkdale in the Toronto and District Cricket Association (TDCA). He sparked great interest during the 2001 ICC Trophy, hosted by Canada. At Toronto’s Eglinton Flats, he thumped a mighty century batting at number eleven for Uganda against Malaysia. In just 54 balls he reached 100 not out, with 8 sixes and 4 fours. Kamyuka impressed many during the tournament as a lively opening bowler and gained experience in South African cricket. Kenneth Wong played Guyana and recently featured in the Western Union 20/20 Guyanese Independence Cricket Festival in Toronto. The TDCA is Canada’s largest cricket league where many Canadian junior and senior internationals have played over the years. It’s top – the Elite - Division has nine teams: Brampton Masters Parkdale, Cavaliers, Centurions, Gujarat, Overseas, Popeyes, Toronto, Vikings and West Indians. The top two in the TJT NCL draft, Hiral Patel and Rizwan Cheema play for Popeyes. Elite Division games mostly take place at Maple Leaf CC (King City), G. Ross Lord Park (Toronto) and the Toronto Cricket Skating and Curling Club on Saturdays and Sundays. Mr. Jain provided some interesting personal background. “I’ve been in Canada practically my whole life. I, like most Canadians, was familiar with football, (ice) hockey and baseball….. When I got married to this beautiful lady sitting in the front row. I tried to make her enthusiastic about baseball. But, she was not impressed by catching a pop-fly in a quarter of a field, and (eventually) I joined her in her in a new sport, at least it was for me, cricket”. The TJT National Cricket League is a professional T20 league that will operate in 2009 at Toronto’s G. Ross Lord Park on Fridays from August 7th until October 2nd. The league is named after sponsors TJT Realty, who are keen to help cricket develop its visibility in the Greater Toronto Area, and across Canada in conjunction with Cricket Canada, and the TDCA. From a cricketing perspective, there are six teams in the league. Interested players were invited to register with the league one day before the draft on the evening of July 23 at the Sapphire Banquet Hall, Mississauga. TJT Realty was impressed that over 400 players registered for the draft, including some from both the Atlantic and Pacific coasts of Canada, and the hall was full. Teams were allowed to draft a main squad of 15 players, plus two reserves in the overall process. In the first six rounds, only players who had confirmed their registration by 7pm at the banquet hall were eligible to be selected. The second phase of the draft, held after a break for dinner, allowed players who were late in arriving at the hall to be added to the draft list. In the third phase, players who were not able to be present on draft night to be eligible for selection. A draw was made to determine the selection order of six teams for the first six rounds. The order of selection was reversed in the second, fourth and sixth rounds. So, for example, the Royals had the last pick of the first round, but then picked first in the second round. The following selections were made in the first six round of the inaugural draft for the TJT National Cricket League. The TTJ club drafting each player is named first, followed by the current TDCA Elite Division club. The Brampton Lions and the Scarborough Riders, each with 3 wins and no defeats, currently head the UAE Exchange Canadian Professional Cricket (CPC) Inter-City regular season standings. Markham Gladiators and Superstars Mississauga, each with 2 wins and 2 defeats, occupy third and fourth places in the eight team T20 league. Oakville Soldiers (1 win, 0 defeats, 1 no result) are in fifth place, ahead of Toronto Warriors (1 win, 3 defeats), United Springdale (0 win, 2 defeats, 1 no result) and Vaughan Jai Ho (0 wins, 2 defeats). The top four teams in the regular season standings advance to the semi-finals. Matches are played on the grounds surrounding the Powerade Centre, Brampton. The Powerade Centre is home to the Brampton Battalion of the Ontario Hockey League during the winter and indoor Lacrosse's Brampton Excelsiors. Tandoori Flame is the Gold Sponsor of the UAE Exchange Inter-City League and African Lion Safari the Silver Sponsor. African Lion Safari is this year “Celebrating 40 Wild Years”. This is the CPC Inter-City League’s second year of operation. The Quebec Cricket Federation (QCF) beat the Ottawa Valley Cricket Council (OVCC) in the annual series between the two leagues. In 2009 the annual encounter was played as a series of T20 matches at Raymond Park, Montreal. Quebec won the first three matches, before the fourth match was abandoned due to rain and cold winds with only Ottawa Valley batting. Vinod Thakur’s 31 from 34 balls provided the base for Quebec in the first match. Canadian international Naresh Patel struck two sixes as the innings drew to a close in a decisive knock of 23 from 17 balls. Patel was one of the three wickets captured by Dennis Fernandez (3 wkts for 24) as Quebec tallied 126 in 20 overs. Ottawa captain Akhber Hussain conceded only 10 runs from 3 overs and took one wicket. His side then struggled against tight Quebec bowling. Ashish Patel, Adhan Suleman, Sohail Tandon and Naresh Patel each bowled 4 overs at costs between 12 and 18 runs. The pressure allowed Roshan Uthayakumar to pick up 3 wickets for 5 runs in two of the last four over. Ottawa Valley reached 89 for nine wickets, losing by 39 runs. Ottawa’s task was made harder by conceding 20 runs in wides and 4 in no-balls during the Quebec innings. Ottawa Valley had the chance of victory in game Two, after making 106 runs, but were thwarted by an unbroken eighth wicket partnership of 43 between Adnan Suleman (13*) and Naresh Patel (19*). Patel sealed the win, striking a six with just 2 balls of Quebec’s 20 overs to spare. Four Ottawa Valley batsmen reached double figures, topped by number five bat Karandeep Singh’s 28 runs from 23 balls from a total of 106 all out. Ottawa’s bowlers cut back on the extras from wides and eliminated the no-balls, but still gave up 5 more wides than Quebec. Effectively, Naresh Patel’s chance to strike the match-winning six came as a result of those extra balls. Quebec was making solid progress until the score reached 59 when the third wicket fell. Five runs later, top-scorer Rahim Gillani departed for 22. When three wickets tumbled with the score stuck on 69, Ottawa Valley must have had high hopes of a win. Certainly Davya Sharma, who took 3 wickets for 12 runs from 4 overs, including that of Gillani, deserved a better fate than being on the losing team. Only opening bat Ahmed Shah (11) and captain Akber Hussain (10), batting at number six, made double figures as Ottawa Valley struggled to 63 all out before 16 overs had been completed in game three. Ashish Patel picked up two early wickets and conceded just 13 runs from his four overs. Sohail Tandon, coming on as first change in the bowling, garnered two wickets for 18 runs in his four overs. Kalpesh Patel, making his first appearance in this series, removed Hussain and pitched in with three wickets for a mere eight runs from three overs. It is hard to defend a low total in limited overs cricket. Ottawa Valley managed to dismiss both Quebec opening bats by the time 16 runs were on the board. Three more Quebec wickets were captured as the progressive total moved from 40 to 47, but Vinod Thakur was on his way to what proved an unbeaten 23, and Rahim Gillani sealed victory with 15 not out from nine balls, including the match-winning six from the first ball of the sixteenth over. Anshul Singh took one for 13 from four overs, and Asif Sheikh’s four overs saw him take one for 14. Summer is supposedly approaching in Canada when cricket is being played on the last day of May. But it seems even the two scorers were finding the going tough as cold rain and howling wins – someone reckoned gale force winds – as Ottawa Valley’s innings ended on 90 all out, mid-way through the nineteenth over in game four. Ashish Patel had Dennis Fernandez caught for 13 runs, leaving Patel with 2 wickets for just 2 runs from 2.3 overs. Patel’s other wicket was opener Anshul Singh, caught before there was a run on the board. Raj Kumar and Sohail Tandon each took 2 wickets while Ottawa’s number ten bat, Asif Sheikh, top-scored with 15 runs. Now the scorers will probably have been out in the open and are stuck sitting at a table, possibly battling to keep the scorebooks, or scoresheets, on the table as the winds blew. Raymond Park, which would at minimum not be windy, but then you cannot see the game. At the conclusion of the Ottawa innings, the powers that be decided enough was enough, the outcome of the series having already been determined. On a different day, the players might have had to battle searing heat. You have to be tough to keep coming back for more in the world of Canadian cricket. *** A festival match was recently played in Montreal’s Jarry Park between a Montreal Police Team and Pak-Can of the QCF that helped foster community relations. Various dignitaries attended the game, and a source indicates the Police were given an award. I have yet to obtain any scoring information on this match. Jarry Park includes the tennis facilities used to host international tournaments. In passing by two cricket matches in late 2007, I noticed the park had a sign for a wireless internet facility but did not have the time to test it out. A concept of turning one of the cricket areas into a field suitable for international matches had been floated. Cricket Canada has handed central contracts to six players - Harvir Baidwan, Umar Bhatti, Rizwan Cheema, Khurram Chohan, Sunil Dhaniram, and Henry Osinde - as Associate countries enter an era of professionalisation. However Cricket Canada clarified that the national team captain Ashish Bagai had not been given a contract as reported for he remained "committed to his career in Europe and will continue to play for Canada as his schedule permits". Bhatti said receiving the contract was a dream-come-true for him. "As a group we can focus on playing cricket without having to worry about other issues, such as going for practice after working a full day, and having to take time off work to go on tours," Bhatti said. "Having half the team as full-time professional cricketers will not only help the standard of the national team's set up but is also helpful in terms of development of cricket across the country … players will be able to help set up and maintain programs for early development of future players." The opening batsman, Geoff Barnett, was also offered a professional contract but turned it down, and he is also unavailable for Canada's home series against Kenya next month due to family commitments. After last weeks call for players to register for the TJT NCL Draft, within 48 hours of the on-line registration opening, there were over 400 players looking to drafted into the newly formed TJT National Cricket League. Top players from across Canada filled out their batting and bowling stats in hopes of getting picked by one of the TJT NCL teams. Team managers for the Titans, Gladiators, Royals, Chiefs, Kings, and Warriors deliberated over the applicants and had a challenging time narrowing the list to a final set of cricketers who were invited to the draft. The TJT NCL Draft 2009, held at Sapphire Banquet Hall and Conference Centre in Mississauga, began with much excitement. The nights hosts, Ajay Jain and Paul Nagpal, provided insight into the future of the league and the potential for cricket in Canada. Opening remarks from Arun Jain, President and Broker of Record of TJT Realty, happy to be a part of the league, included his reason for being involved: Growing up in Ottawa, I was not only not able to play cricket, but people did not even know that it was a sport! With remarks from Presidents of Cricket Canada, the Ontario Cricket Association, and the Toronto & District Cricket Association, and Presidents of the Brampton Cricket Association and the Etobicoke District Cricket Association in attendance, it was apparent that this league was garnering major interest not only from players, but all parties interested in furthering the sport in Canada and beyond. At this point, the real event began. With managers picking numbers from a TJT NCL cap, the draft order was determined. With the Chiefs selecting first, it took only a minute before Hiral Patel was picked. Selecting second was the Gladiators; again another easy choice picking Rizwan Cheema. Rounding out the first round was the Kings selecting Kenneth Kumyuka, Warriors selecting Kenneth Wong, Titans selecting Damoudar Daesrath, and Royals selecting Dhanuka Pathirana. The night continued with lots of ecstatic players, overjoyed that they were selected for the league. After 15 rounds of player selections and another 2 rounds for reserves, the night ended off on a happy note for most; all six teams came away with a full roster consisting of some of the best players in Canada. For a complete list of all teams and players drafted, as well as photos from the night and upcoming game schedules, please visit www.nationalcricketleague.com . National cricket captain, Ashish Bagai, is leaving his job in England's financial sector at the end of August to join Cricket Canada full time. He's one of seven national players who have accepted central contracts with the national cricket association. The others are medium-pacers, Umar Bhatti, Henry Osinde and Harvir Baidwan, and all-rounders, Rizwan Cheema, Khurram Chohan and Sunil Dhaniram. "These players are the nucleus of our team for the 2011 World Cup and we are excited to have them under contract," said coach Pubudu Dassanayake. "Having Ashish in the fold full time is absolutely great news because he has proved that he's one of our best players. He has always contributed when he's available and we are delighted he's committed to the program until the end of the next World Cup." Bagai represented Canada in the recent One-Day Internationals in Scotland and The Netherlands. He was, however, unavailable for the four-day Intercontinental Cup matches because of work commitments. Cricket Canada's acting chief executive officer, Ingleton Liburd, said opener, Geoff Barnett, was also offered a contract which he turned down, citing personal commitments. The left-handed batsman, who was hobbled by a back injury during the recently concluded European tour, has also informed Cricket Canada that he's unavailable for next month's home series against Kenya because of a family engagement. Liburd said the contracts will be reviewed annually and the contracted players will be remunerated according to their seniority and significance to Canadian cricket. The national side returned home last Sunday after winning just one game during their three-week European tour. Canada defeated Scotland by six wickets in the first of two One-Day Internationals. The Scots won the second contest by five wickets and the four-day Intercontinental Cup fixture by 29 runs. Canada dropped a 50-run decision to The Netherlands in their first ODI while the second was washed out by rain. The four-day match was also ruined by bad weather. The 10-team field that will take part in the International Cricket Council (ICC) Under-19 World Cup global qualifier in September is now complete after the last of the regional qualifiers ended last Monday in Jersey, in the British Channel Islands. Ireland and The Netherlands finished first and second respectively in the European youth tournament. The Irish, Dutch and Scots were 5-1 in the series, but Scotland lost out on net run rate. Canada will host the United States, Hong Kong, Afghanistan, Uganda, Papua New Guinea, Vanuatu, Ireland and The Netherlands in the global qualifier in the Greater Toronto Area from September 1 to 13. The top five teams will join Kenya and the ICC's 10 Full Members, Australia, England, West Indies, India, Pakistan, Bangladesh, South Africa, Sri Lanka, Zimbabwe and host country New Zealand in next year's 16-team youth World Cup. Canadian Under-19 star Hiral Patel was, to many, the surprise first overall pick in the inaugural TJT National Cricket League draft on Thursday night. Many in the crowd assembled at the Saphire Banquet Hall, Mississauga, expected Rizwan Cheema to be top pick, but the Chiefs, who won the draw to pick first, opted for the young all-rounder. The Gladiators took Cheema as the second overall pick. Patel said “he knew he was under consideration” as a leading choice, but he admitted it was “a little bit of a surprise.” The draft for the new six team professional T20 league came hot on the trail of Patel winning Player of the Tournament and Best Batsman awards in the ICC Americas Under-19 Championships. A number of other Canadian U19 players were picked in the early rounds of the draft. Indeed, the first pick in the second, third and sixth rounds of the draft were from that squad. Rustam Bhatti (7th overall), Usman Limbada (13th overall) and Darius D’Souza (31st overall) being the selected youngsters. Ugandan all-rounder, Kenneth Kamyuka, was chosen third overall by the Kings. Kenneth Wong became the first player drafted by the Warriors, the Titans took Damodar Daesrath and the Royals closed the opening round of the draft with the choice of Dhanuka Pathirana. Only players who were present at the Banquet Hall on Thursday night and had confirmed their registration by 7pm were eligible for the first six rounds. Late comers were only eligible for the second phase of the draft. Those from well beyond the Greater Toronto Area were placed in the third phase of the draft. Each team could select 15 players plus two reserves in the overall draft process. Mr. Jain has “lived in Canada for most of my life. Like most Canadians I was familiar with football, (ice) hockey and baseball, but my lovely wife was not impressed by catching a pop-fly in a quarter of a field, and (eventually) I joined her in her sporting fare of cricket”. The TJT National Cricket League is set to begin on August 7th, with matches being played at Toronto’s G. Ross Lord Park. It will operate on Friday’s until early October. After falling agonizingly short of a victory in two tries in Europe, Canada returns home to take on Kenya in the third and final Intercontinental Cup match of the calendar year. The match will take place August 7-10 at Maple Leaf Cricket Club in King City Ontario. Following the 4-Day match, Canada and Kenya will square off in a 3 ODI series with matches on August 12, 14, and 16th also at Maple Leaf Cricket Club. Canada and Kenya last squared off in limited overs cricket earlier this year when Canada handed the Kenyan’s a heavy defeat at the world cup qualification tournament in South Africa. That match did not however have ODI status. As many as six teams are likely to be formed today (Thursday) to give a final shape to the newly launched TJT National Cricket League. The organizers are hopeful of producing country's top players while representing the Warriors, Titans, Gladiators, Royals, Chiefs, and Kings in the prestigious TJT Cup. Ravin Moorthy, Second Vice President of Cricket Canada, said the country's cricket governing body is glad that top national players are coming to compete each other. "We are pleased to see that players from across Canada will get an opportunity to compete against each other on the national stage," said Moorthy. The Cup, which is a joint venture of TJT Realty and Toronto District Cricket Association, will begin Aug 7 and run every Friday at G. Ross Lord Park in Toronto. The TJT Cup will be presented to the winner of the season-ending Twenty20 Tournament on Oct 2. In connection with the formation of teams, the organizers at meeting today (Thursday) at Sapphire Banquet Hall and Conference Centre in Mississauga present a final draft of the league. "A high profile draft and league such as this will be a tremendous boost to the domestic cricket scene, and increase the level of competition to drive the sport forward." Most of the TJT Cup players will also be making guest appearances at the Masala! Mehndi! Masti Festival at the Exhibition Place this weekend. They will provide bowling and batting demonstrations to the fans throughout the weekend. TJT NCL will bring together the best players to compete in league play and the prestigious TJT Cup will be presented to the winner of the season-ending Twenty20 Tournament on October 2nd. League play will begin on August 7th and run every Friday with all matches held on the cricket pitches in G. Ross Lord Park in Toronto. Six teams will be formed on July 23rd, at the TJT NCL Draft, held at the Sapphire Banquet Hall and Conference Centre in Mississauga. This draft, the first of its kind within the Canadian cricket community, will distribute the top players into newly formed teams: the Warriors, Titans, Gladiators, Royals, Chiefs, and Kings. Ravin Moorthy, 2nd Vice President of Cricket Canada, excited about the new league, said: “We are pleased to see that players from across Canada will get an opportunity to compete against each other on the national stage. A high profile draft and league such as this will be a tremendous boost to the domestic cricket scene, and increase the level of competition to drive the sport forward." Many of the top picks at the TJT NCL Draft will be making guest appearances at the Masala! Mehndi! Masti! Festival, which runs from July 24th to July 26th at the Exhibition Place. The players will be providing cricket demonstrations throughout the weekend, as well as bowling and batting with all of their fans. TJT NCL will be an exciting part of Canadian Cricket; continue to follow the new league at www.nationalcricketleague.com. A long delay due to rain on the last day, and a defiant innings of 98 not out in 294 balls from Daan van Bunge thwarted Canada ’s hopes of an outright win in the ICC Intercontinental Cup match against the Netherlands in Rotterdam . The Dutch had lost 5 wickets for 120 runs going into the final day, but rain delayed the start of play until after 3 pm and the game ended with the Dutch second innings on 233 for 8 wickets. Canadian captain Umar Bhatti took 4 wickets for 32 runs in the Dutch second innings. Canada had battled back strongly into the match, after conceding a first innings lead of 52 runs. Sandeep Jyoti was Canada ’s top scorer with 37 in a first innings of 177 all out. The Dutch replied with 229 all out, opening bat Nick Statham making 57. Sunil Dhaniram lead the way in Canada ’s second innings with 144 and Canada declared at 419 for 9 wickets. Dhaniram and Qaiser Ali, who made 61, shared a fourth wicket partnership of 133 runs that started to turn the tide Canada ’s way. But in the end, rain and defiance from van Bunge, wicketkeeper Bart Schilperoord (27 in 65 balls) and Marty Jonkman (12 in 68 balls) stopped Canada from gaining an outright win. Canada lost by 29 runs to Scotland in Aberdeen , earlier in July in its opening ICC Intercontinental Cup match of the 2009-2010 round-robin schedule. The unresolved CUPE city workers strike in Toronto has resulted in cricket being knocked out of this weekend’s 5th Asian Community Games. This is disappointing as the sport only entered these games last year with a two-day event at Etobicoke’s Centennial Park. It drew the interest of many GTA members of Federal and Provincial parliaments, and included the annual City of Toronto versus the Toronto Police match; a series that goes back over 20 years. The strike has also resulted in basketball and soccer events for these games re-locating to the Burnhamthorpe Adult Learning Centre, 500 East Mall, Etobicoke, from Centennial Park. There are four other sports in these games: badminton (Hershey SportsComplex, Mississauga), table tennis (Canadian Chinese Table Tennis Centre, Markham), track and field (Toronto Track and Field Centre, York University) and volleyball (University of Toronto, Scarborough). The games operate under the banner of ‘Diversity in Action’ and seek to bring people from different communities together through participation in sports. An all-around performance by Sandeep Jyoti has his Canadian team on the verge of defeating The Netherlands in the ICC Intercontinental Cup, which wraps up tomorrow in Rotterdam. Showing he can do it with both bat and ball, the Mississauga Ramblers star scored a team-high 37 runs in the first innings and took three wickets during the hosts’ turn at bat. In the second innings, Jyoti’s bat remained hot as he knocked in 35 more. At stumps today, the score stands at Canada 177 & 419 for 9 declared and The Netherlands 229 & 120 for five wickets. Going into the final day of the four-day match tomorrow, the home side requires another 248 runs with five wickets remaining. Jyoti's heroics cap off an impressive tour of Europe for the 35-year-old all-rounder, who bats right hand and bowls off-spins. Earlier, in a one-day friendly against Scotland, Jyoti, with a career-best 117, and captain Ashish Bagai, with an unbeaten 92, steered Canada to a thrilling victory as they reached their target in the penultimate over. The ICC Intercontinental Cup is a competition among seven non-test playing nations: Scotland, Ireland, Kenya, Afghanistan, The Netherlands, Zimbabwe and Canada. A round-robin of four-day matches is played over the course of two years. Canada went down to Scotland by 29 runs in its first outing earlier this month. Jyoti, who bats at the top of the order for Canada, made his international debut in 2002 during the West Indies Red Stripe competition. He arrived in Canada from India when he was 14 and wasted little time involving himself with the Ramblers. Although Jyoti has outgrown the local club, Supaul notes he remains with the organization as head coach to groom the next generation of cricketers. The loss of half of the day's play to rain left Canada trying to capture five wickets in the reamins of the day- a task that was beyond them, mainly thanks to an unbeated 98 from Van Bunge. Netherlands overnight were 120/5, still needing 248 to beat Canada. Rain however prevented play, and Canada had to wait until mid-afternoon for the restart, still needing 5 wickets and having 41 overs to take them. Bhatti made the breakthrough in the third over of the day, trapping Brand lbw and ending a partnership of 53. No more wickets fell before tea, when Netherlands were 156/6 from 59 overs. At least 26 overs remained to be bowled. It was not until the 10th over of the post tea session that Canada struck again when Zahir dismissed Schilperoord. 3 wickets to take, and van Bunge still there on 68*. They only managed one more wicket before the close as van Bunge (98*) marshalled the tail, Jonkman lasting 68 balls, and Seelar 17. Canada are in a strong position on the third day of the Intercontinental Cup match against Netherlands. A fine innings of 144 from Dhaniram, well supported by the lower order allowed Bhatti to declare, setting Netherlands a target of 368. Bhatti took the first three wickets of the Netherlands 2nd innings with only 34 on the board, putting Canada well on course for victory. Canada, resuming on 215/3, added only two runs before Qaiser Ali was caught and bowled- his partnership with Dhaniram was worth 133, and he'd made 61. Keshvani came and went quickly for 8, but Dhaniram, accompanied by Mulla took the Canadian lead past 200 with no further loss. Dhaniram completed a fine century (his second in first-class cricket) from 135 balls, with twelve fours and two sixes. He and Mulla put on 92 before Mulla was caught and bowled for 40, and Bastiampillai followed shortly afterwards, lbw for a 9-ball duck. At lunch Canada were 340/7 with Dhaniram on 142, and Chohan still to score, a lead of 288. In the third over of the afternoon session Dhaniram was caught by Brand (who had dropped three in the morning session) for a personal best 144 (178 balls, 14x4, 2x6). Bhatti and Chohan took the attack to the Netherlands, Bhatti at one point striking three successive boundaries. He made 36 before being caught in the deep and put on 52 runs with Chohan. A boundary from Chohan took Canada past 400, and the lead over 350. Bhatti eventually declared, with Canada on 419/9, Chohan 36*, Zahir 5*. The Netherlands will need 368 to win, with the rest of Day 3 and a full day of play tomorrow to bat. Canada got off to a great start when Bhatti dismissed first-innings top-scorer Statham lbw 2nd ball, and he struck again, having Barresi caught behind to leave Netherlands 12/2 at tea. He captured his third wicket to reduce Netherlands to 34/3, returning figures of 9-3-24-3 in his opening spell. Chohan had a struggling de Grooth caught for the fourth wicket, and then struck again with Borren caught at slip - 77/5. Brand and van Bunge held out to the close, with Netherlands at 120/5, still needing 248 to win. On the second day of the Intercontinental Cup match, Canada built a useful lead in their second innings, after conceding a 52 advantage to the Netherlands first time around. Canada, at one point 84/3, passed 200 with no further loss, thanks to half-centuries from Qaiser Ali and Dhaniram. Netherlands resumed at 74/3 and advanced to 131 without further loss until Stathem was run out for 57. Borren was caught at deep backward square off Dhaniram, and de Grooth was stumped off Bhatti for 36- he left the ball then stepped out of his crease and an alert Mulla took advantage of his mental lapse. Netherlands moved comfortably past Canada's total without losing another wicket, and reached 197 before Jyoti struck for the third time. Spin continued to prosper as Zahir took his 2nd wicket -219/8. Cheema finished off the innings with two wickets from consecutive balls, and Netherlands led by 52 on first innings. Canada were perhaps fortunate that the Netherlands were without Ryan ten Doeschate who was busy making an unbeaten 159 for Essex. Barnett was dropped from the first ball of the second innings as he drove straight - the ball still went for four and he continued with positive intent, despite losing his partner Cheema caught at mid-off 2nd ball. Barnett hit five boundaries in his 37 from 43 balls before being caught and bowled, leaving Canada at 59/2. At tea, Canada were 63/2, Jyoti on 17, and Qaiser Ali yet to open his account. Jyoti made 35 before van Bunge spun a delivery to take the outside edge. Dhaniram and Qaiser Ali put together an excellent partnership. Dhaniram initally was the more aggressive, but both hit sixes off the spinners. Dhaniram reached an excellent fifty with a cover-driven boundary and the lead passed three figures. Qaiser Ali brought up his half-century and the 200 with a slog-sweep for six. At stumps, Canada were 215/3, Dhaniram 68*, Qaiser Ali 60*, a lead of 163. Canada won the toss and chose to bat in the 4-day Intercontinental Cup match against the Netherlands. A sub-standard batting performance resulted in a total of just 177 with Jyoti's 37 the top score. In reply Netherlands are 74-3 at stumps. The Canadian team was G Barnett, S Jyoit, R Cheema, Qaiser Ali, TC Bastiampillai, S Dhaniram, +AA Mulla, S Keshvani, Khurram Chohan, *U Bhatti, and Zameer Zahir. Canada got off to a poor start when Barnett was bowled for a duck in the first over, but Cheema, positive as always, hit a couple of boundaries before being caught at slip for 19, and with the score on 33. Jyoti and Qaiser Ali consolidated putting on 39 before Jyoti (37) hit a hard return catch to Borren. Dhaniram hit 17 off 18 balls before being caught trying to cut, and Qaiser Al i (19) gave Borren his third wicket two balls later. At lunch Canada were 102/5 with Bastiampillai and Mulla batting. Bastiampillai was beaten in the flight and bowled by Seelar. Keshvani (12) and but Mulla (playing with uncharacteristic circumspection for 28 from 89 balls) provided some resistance, but Canada were all out for just 177. Bhatti and Chohan opened the bowling and restricted scoring - Bhatti's 9 overs cost just 13 runs - but were unable to make a quick breakthrough. The dutch openers took the score to 44 before three wickets fell in quick succession, one to Zahir and two to Jyoti (both caught by Bastiampillai at short leg) , reducing Netherlands to 55/3. No further wickets fell before the close on a day when spin dominated, taking 9 of the 13 wickets that fell. Canada and the USA took the top two places in the ICC Americas Under-19 Qualifier that was ended by mighty winds and rain on Saturday July 11 at Maple Leaf Cricket Club, King City. The neighbours and rivals advance to the ten team ICC Global Under-19 World Cup Qualifier to be played from September 1 thru September 13 in the Greater Toronto area (GTA). Canada topped the Americas Qualifier standings with an unbeaten record from round-robin play, closing with wins over the USA, and Bermuda, Americas Under-19 Regional Champions in 2007. Canada’s Hiral Patel topped the individual honours as Tournament MVP and best batsman. Right-hand opening bat Patel scored 305 runs in 5 innings, ending with 95 against Bermuda. He chipped in with six wickets for 90 runs from 29 overs and two catches, including what proved the last catch of the tournament. After Patel caught Bermuda’s Deunte Darrell on the deep mid-wicket boundary to end a stand of 54 runs, a massive storm hit the ground. Patel’s innings helped Canada to 170 for 7 in 33 overs. The storm left Bermuda on 111 for 4 wickets from 24.2 overs. The Duckworth/Lewis charts were called in, and Canada won by 5 runs. Bermuda captain Terryn Fray was on 45 not out. Canadian captain and wicketkeeper/batsman Rustam Bhatti won the best wicketkeeper award. Spinner Chris Douglas (Bermuda) was selected the best bowler and Greg Sewdial (USA) top fielder. There were no surprise results involving the top three countries against Cayman Islands, Argentina or the Bahamas. The USA’s 61 run win over Bermuda on Wednesday was a major dent to Bermuda’s hopes. The US score of 230 all out involved a fight-back by the Bermudian bowlers, or a lapse by the US batsmen, after reaching scores of 128 for 2 and 185 for 3. Captain Terryn Fray and Chris Douglas seemed have Bermuda on course to challenge the US mark, but 128 for 2 wickets became 132 for 6 in two shakes of a lamb’s tail against the US left-arm spinners. Chris Douglas mis-drove, skied the ball and was caught for 27. Greg Sewdial took a nifty close catch, Terryn Fray was trapped leg-before wicket (lbw) for 37 and the next batsman scooped a return catch to Azurdeen Mohammed. Earlier, Mohammed had scored 60, opening the batting for the US, and Ryan Corns 63. Canada beat the USA on Friday, based on good scores from the top four batsmen, but tallied a disappointing 193 for 9 wickets from 50 overs. Ruvindu Gunasekera lead with 42 runs, Nitesh Kumar made 36, with scores of 31 from both Hiral Patel and Rustam Bhatti. Early breakthroughs by the pace bowlers gave Canada hope, but Sewdial battled to put his side in the hunt. A throw from Usman Limbada scored a direct hit on the stumps to leave Sewdial run out for 41 (119 for 6 wickets) and four overs later, the Canadians celebrated as the US crashed to 131 all out. Meanwhile Bermuda beat Bahamas by 106 runs to setup a last day where a big Bermudian win over unbeaten Canada, or a surprise Cayman Islands win over the USA might bring a surprise in the final standings. The predicted storms, which hit practice for the much more publicised Honda Indy on the Toronto lakeshore, delayed play until around 2.30pm. The US-Cayman game was first underway and just reached a finish as the first drops of rain began to fall of what proved a short but frightening storm. US captain Shiva Vashishat top scored in a 35 over total of 226 for 8 wickets and Henry Wardley made 44. Left-arm spinner Yash Shah took 3 wickets for 12 runs as the Cayman Islands were bowled out for 65. Winds howled from the north, two spots of rain, then sheets of rain. An extended finish to play had been set due to the late starts, as it is light until late in these northern parts in mid-summer, but it was soon evident there would be no more play as players and officials sought safety. It was, apparently, just 15 minutes of mayhem. While England and Australia were generating worldwide attention for the Ashes test series, Canada and the USA moved on, at the Under-19 level and relatively anonymously, to the September World Cup qualifier. But these two countries met in the first international cricket match in September 1844. There is cricketing promise in both countries, but better organization, facilities, funding and promotion is sorely needed. It is small progress that Canada’s players had numbered shirts, but no names. A couple of the players used black tape to add numbers to their sweaters on the colder days, but the governing body of Canadian cricket did not issue lists of playing numbers by team, or even have a board with details of scores and standings posted. Meanwhile, some of the folks propping up the tournament put in 18 hours or so per day. The ranking Canadian cricket official did give a welcome to all the teams….during the closing awards presentations! Patently work is required on the public relations front. Details of the September ICC Under-19 World Cup Qualifier in the Greater Toronto Area will emerge later. It will be a round robin involving five matches a day for a total of 45 matches. The ten participants will be the two qualifiers from each of the ICC’s five regions. The European qualifier is taking place from July 14th in Jersey. The Americas’ qualifiers Canada and USA will be joined by African contenders Uganda and Sierra Leone, the Asian Cricket Council duo of Afghanistan and Hong Kong, plus East Asia/Pacific qualifiers Papua New Guinea and Vanuatu. The European qualifier involves Ireland, Scotland, the Netherlands, Denmark, Guernsey and Jersey. Netherlands captain, Peter Borren, is not expecting an easy task when his weakened side takes on Canada in the opening game of their ICC Intercontinental Cup campaign in Rotterdam on Wednesday. The match is Netherlands' first in the competition since they finished fifth in the previous tournament and they haven't played any cricket since August 2008, when they hosted Kenya. Rustiness, however, isn't Netherlands' biggest problem for they are without experienced players such as Ryan ten Doeschate, Alex Kervezee (on county duty with Essex and Worcestershire respectively), Mudassar Bukhari and Bas Zuiderent. "It won't be an easy task as we will be without our experienced batsmen like Doeschate, Schiferli, Kervezee, Bukhari and Zuiderent," Borren said. "But we have tried to bolster our batting as much as possible by strengthening the middle order. "It will all be about seeing through the new ball and the batsmen can do it by showing application and discipline. Of course, it is easier said than done considering the batsmen haven't played any four-day cricket in nearly 12 months but we have to switch to the four-day mode and this is where it all starts." Borren was confident that Netherlands' batsmen would be able to counter Canada's in-form bowlers. "Canada is a good bowling side with bowlers like Henry Osinde, Umar Bhatti and Khurram Chohan. We have seen a lot of the Canada players in the limited overs version and have the highest respect for them. We know what they are capable of which makes it easier for us to put together a game plan. But making a strategy and implementing it are two different things." Canada go into the contest having lost an Intercontinental Cup fixture in Scotland by 29 runs, a match in which their bowlers impressed but their batsmen struggled, managing totals of only 142 and 213. They fared better in the one-day series, though, which was drawn 1-1, with Sandeep Jyoti hitting a match-winning 117 in the first game and Sunil Dhaniram making 92 in the second. The tour of Netherlands started poorly with a loss in the first ODI on Saturday and a washout on Sunday but Canada's captain Umar Bhatti remained positive. "We can take a lot of heart and encouragement from our batting performance in the last three ODIs. I'm confident the batsmen will carry that form into the four-day version and help us end the European tour on a winning note," Bhatti said. "I think the wicket will help the batsmen more than the bowlers which should give more confidence to the batsmen. In a longer version of the game, the batsmen have to put big totals on the board and the bowlers have to take wickets. It's as simple as that. Our bowling has been up to the mark and it is now up to the batsmen to make sure we have enough runs on the board." Netherlands: Peter Borren (capt), Mark Jonkman, Pieter Seelar, Wesley Barresi, Tom de Grooth, Bart Schilperord, Nick Statham, Eric Szwarczynski, Berend Westdijk, Daan van Bunge, Jeroen Brand. Canada: Umar Bhatti (capt), Zameer Zahir, Havir Baidwan, Geoff Barnett, Trevin Bastiampillai, Sandeep Jvoti, Sunil Dhaniram, Shaheeb Keshvani, Khurram Chauhan, Ashif Mulla, Henry Osinde, Qaiser Ali, Rizwan Cheema, Abdool Samad. CBC reports that a man was beaten to death with bats after an altercation broke out between a group playing cricket and one playing volleyball in Scarborough. Steady rain prevented any play in the second one day match between Canada and Netherlands in Amstelveen. Canada wins, US progresses but big storm ends play! It looked like the storm clouds might unleash all day at Maple Leaf Cricket Club, but the rains relented and play began around 2.30pm. The match between Canada and Bermuda was set for an interesting finish as Darius D’Souza had Deunte Darrell caught on the deep mid-wicket boundary by Hiral Patel that broke a stand of 54 for the Bermudian fourth wicket. Canada had made 170 for 7 in a match reduced to 33 overs. But the skies were interesting; directly to the west were some light blue skies and fluffy white clouds. But there were some really dark looking clouds…and before the next batsman arrived at the crease, the players began to run for cover. Sadly, the storm is likely to have made more impact than this cricket championship in the Greater Toronto Area, but the winds certainly howled and I gave up the battle to walk northerly in the hope of finding the pavilion. Indeed I retreated to the southern fence and curled in a ball as the wind howled and rain pelted down. It seemed like hailstones hitting my back….but I’m told it wasn’t. Some winds. As the storm cleared and a rainbow formed, it became obvious some branches had been blown down around the ground. And instead of Canadian fielders, a chair had been blown into the outfield on the south-east pitch. The top part of the pitch on the north-east pitch was under water on a mission to pick up a camera and tripod, but it turned out the USA had already bowled out the Cayman Islands. There clearly could not be any further play, and the Duckworth/Lewis method determined Canada had won by 5 runs over Bermuda, to complete the tournament unbeaten with 5 wins. The win sealed the Americas Regional Under-19 Championship and a place in the ICC Global Under-19 Cricket World Cup Qualifier in September. The USA also progresses to that qualifier, thanks to 4 wins and 1 loss. Bermuda, who won the Americas U19 title in 2007, was left in third place with a record of 3 wins and 2 defeats. Bahamas emerged as winners of the match with Argentina to determine who would foot the standings. Argentina was struggling on 88 for seven when the storm arrived. Bahamas had scored 186 for seven from 22 overs. These teams were probably the luckiest as they were on the south-west field, right next to the building complex, and those not out on the field had the buildings as slight protection from the worst of the winds. It was fitting, in a way, that Canada’s match ended with Hiral Patel as a central figure. Earlier he continued his tournament batting form to make 95 before being caught having put the side into a useful 148 for three. Bermuda’s Chris Douglas took 2 wickets to close the tournament with as leading bowler. Douglas tallied 14 wickets for 123 runs from 29.3 overs. Canada’s Rustum Bhatti was named best wicketkeeper. The storm meant post tournament presentations took place inside, but the sun was shining and the players enjoyed a barbecue. Most were able to change clothes, but the drenching made some feel cold, but the event was played in good spirit. The efforts of those at the helm of tournament organization, the umpires and the scorers deserve a vote of thanks, as do the groundstaff and helpers at the Maple Leaf ground. Some supporting photos and broader comments on the day’s play will follow after I have curled up somewhere warmer than in driving rain and high winds near a tree and a wire mesh fence at the southern end of a cricket ground. Unable to see the buildings that were hardly any distance a way. But, another personal first at a cricket match, but one I would rather not have had. Hopefully the note pads and player detail lists I was using will have dried in a few hours time. It was one time when singing 'When you walk through a storm hold your head up high' was a distinctly wrong idea, but the cricketing romance returned with the rainbow and the sun. Not to mention the two oldest rivals in international cricket now have the chance to progress to the next ICC Under-19 Cricket World Cup. Canada played Netherlands today in the first of two one-day internationals prior to a 4-day intercontinental cup match. Canada won the toss and asked Netherlands to bat. The Canadian team is Rizwan Cheema, GEF Barnett, S Jyoti, ZE Surkari, *+A Bagai, S Dhaniram, Khurram Chohan, S Keshvani, HS Baidwan, MM Zahir, and H Osinde. Netherlands made 237/7 from thier 50 overs, thanks to 75 from Kervezee and 50 from Borren. 6 Canadian bowlers took wickets with good performances from Cheema ((1/32 from 10 overs) and Zahir (2/35). Cheema hit his top form, making 94 out of 137 when he was at the wicket, crashing 13 fours and three sixes. When he was out, Canada needed just 100 from 25 overs. There was little support from the rest of the batting however, with Barnett, Jyoti, Surkari and Bagai all getting into double figures but failing to reach 20. Schiferli took four wickets, and Canada collapsed from 149/3 to 187 all out, with 11 overs still remaining. 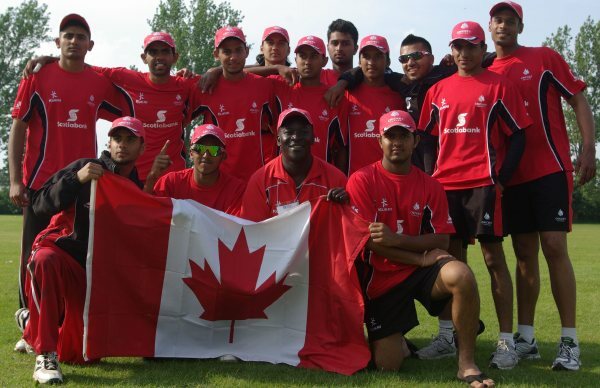 Canada's Under-19 cricketers seem certain to take one of the two places in the ICC Global World Cup qualifier after beating the USA by 62 runs on Friday. Canada takes an unbeaten 4/0 record into its final round robin match with Bermuda (3/1), while the USA (3/1) faces Cayman Islands (2/2) on Saturday. The Canadian side was upbeat following Friday's win and will be seeking to go unbeaten in this tournament. A win for Bermuda on Saturday could see three teams close with 4/1 records, which would bring in net run rate (NRR) as the tie-breaker. But Canada has a much better NRR than either the USA or Bermuda, which should see Canada into the top two, if Bermuda wins. The Canadian camp will not be looking to this eventually. Canada scored 193 for 9 wickets in 50 overs against the USA. A lower total than seemed likely after a promising start by the top four batsmen. Opening bat Ruvindu Gunasekera made 42, Nitesh Kumar 36 and captain Rustum Bhatti 31. Hiral Patel made 31, the first time he failed to score at least a half-century in this tournament. Darius D'Souza (12) and Hardik Kotak (14 not out) were the only other Canadian batsmen to reach double figures. US Captain Shiva Vashiat took 3 wickets for 40 runs. Maninder Auklah soon dismissed both US opening batsmen. There were fears the Canadian total was inadequate, but the game turned on a run out. Usman Limbada's throw scored a direct hit on the stumps and the promising innings of Greg Sewdial was over. Sewdial made 41. Gunasekera took 2 wickets with his leg-spin bowling, including Regis Burton. Burton and Sewdial had been looking to turn the tide in the USA's favour, but Canada had made the crucial breakthrough and the US innings was soon over for 131. The last two wickets fell to catches by Zain Mahmood off Hiral Patel's bowling. Patel ended with 3 wickets for 28. Bermuda scored 257 for 9 wickets, then bowled out Bahamas for 151. The Bermuda total was less than seemed likely when Carl Douglas and Joshua Gilbert were scoring freely. Douglas top-scored with 78 and Gilbert reached 50. Only Kamau Leverock (36) of the later batsmen made runs. Orlando Stuart was Bahamas most successful bowler, taking 4 wickets for 43 runs. Jermaine Adderley scored 51 of Bahamas 151 all out. Cayman Islands captain Ramon Sealy notched 77 runs out of 100, but his departure began a succession of dismissals and a final score of just 165. This proved sufficient as Argentina replied with just 74 all out. Zachary McLoughlin took 4 wickets for 19 runs and Dale Parker took 3 wickets for 8 runs. Argentina's Lautaro Musiani took 4 wickets for 28 runs. All matches are being played at the Maple Leaf Cricket Club, King City, Ontario with a scheduled start of 10 am and have a limit of 50 overs per side. The ground is at the corner of Dufferin Street and 15th Sideroad in King City, Ontario. TJT Realty, together with the Toronto and District Cricket Association, announced the formation of the TJT National Cricket League (TJT NCL) today. TJT NCL will bring together the best players across Canada to compete in league play and the prestigious TJT Cup presented to the winner of the season-ending Twenty20 Tournament on October 2nd. League play will begin on August 7th and run every Friday with all matches held on the cricket pitches in G. Ross Lord Park in Toronto. The formation of this new league will bring major changes to the way the game is managed and viewed by cricket fans across North America. Six teams will be formed on July 23rd, at the TJT NCL Draft, held at the Sapphire Banquet Hall and Conference Centre in Mississauga. This draft, the first of its kind within the Canadian cricket community, will distribute the top 84 players into newly formed teams: the Warriors, Titans, Gladiators, Royals, Chiefs, and Kings. Many of the top picks at the TJT NCL Draft will be making guest appearances at the Masala! Mehndi! Masti! Festival, which runs from July 24th to July 26th at the Exhibition Place. The players will be providing cricket demonstrations throughout the weekend, as well as bowling and batting with all of their fans. The TJT NCL will be an exciting part of the Canadian Cricket scene; continue to follow the new league at www.nationalcricketleague.com. Please direct all inquiries to Paul Nagpal at info@nationalcricketleague.com. Canadan, Jul 9: The powerful ‘Dhinchaks XI’ clinched the prestigious MFSI Trophy and ‘Sauga Centurions’ won the Runners-up in the MFSI Cricket Tournament, a long awaited tournament by Indian Cricket enthusiasts held last Saturday at the Oakville Cricket grounds organized by the Mangalorean Friendship Series Initiative here in Mississauga, Canada. It was truly a fun-in-the-sun event thoroughly enjoyed by hundreds of cricket lovers. Cricket in the sunshine is what every enthusiast and aficionado in the sport dreams about. And MFSI was blessed with a day full of it. The event was well attended and a festive atmosphere prevailed throughout the day. The ground ambience was picturesque with churches and steeples and trees in full bloom and well laid grass surrounding an artificial turf wicket. Canada, as expected, comfortably beat Argentina while the USA beat Bermuda in a key match featuring two of the three sides fancied to challenge for the top two places in the ICC Americas Under-19 Regional Qualifier. These results mean Canada and the USA go head-to-head with unbeaten records (3 wins, no defeats) on Friday at Maple Leaf Cricket Club, King City. Canada scored an impressive 344 for nine wickets against Argentina. Opening bat Hiral Patel struck his third half-century of the tournament in notching 55. Captain Rustum Bhatti hit 65, Nitesh Kumar 61 and Arsalan Qadir struck 51 in the later overs. Qadir followed with 3 wickets for 12 and leg-spinner Ruvindu Gunasekera made a late, but highly successul appearance in the Canadian bowling. He took 3 wickets for just 2 runs as Argentina was bowled out for 75. The USA will be pleased to have beaten Bermuda by 64 runs, but the coaches in each camp will surely focus on how each side seemed to be well on the way to scoring many more runs. The USA was going well, even after losing its second wicket at 128, but the efforts of Azurdeen Mohammed and Ryan Corns almost went to waste in a total of just 230, with several overs unused. Ironically, captain Terryn Fray and Chris Douglas were going well until Douglas mis-drove and was caught. A couple of overs later, Bermuda had spun to 132 for 6. There were no late heroics for Bermuda, whose 166 all out left the US winners by 64 runs. Cayman Islands picked up its first win of the tournament, beating Bahamas by 8 wickets. Bahamas was bowled out for just 75 runs. Thursday is a rest day, so on Friday Canada and the USA will meet in a game pivotal to both the Under-19 Regional Championship and for the two places in the Under-19 Global World Cup Qualifier to be held in September. The fifth and final round-robin games to decide the top two places are on Saturday, when the US would be expected to beat Cayman Islands, but Canada faces Bermuda. Many more people around the world will be following the current England-Australia Ashes series cricket than the Canada-USA Under-19 game, but Canada and the USA first met at senior level on the cricket field back in 1844. Long before the England-Australia cricketing rivalry began. This year is the 150th anniversary of the first overseas tour by English professionals...who visited Canada and the north-eastern parts of the USA. Canada struggled early on with the bat after winning the toss against Scotland, at one point having 5 wickets down for only 96. However, an excellent innings of 92 from Dhaniram allowed them to set Scotland a target of 251. However solid innings from Hamilton, Watson and McCallum saw Scotland to victory with 2.4 overs to spare. On a day when when the eyes of most cricket fans in the UK will be focussed in southern Wales, another international match is taking place in Aberdeen as Canada take on Scotland. Canada are unchanged following their sensational win yesterday, while Scotland brought in Lyons to replace the injured Stander. Canada won the toss and elected to bat. Cheema got the Canadian innings off to a rousing start with two pulls for boundaries in the first over. He tried the shot again in the 3rd over, only to sky a catch to mid-wicket. that brought in yesterday's hero, Jyoti but he was out of luck today, as despite apparently edging his second ball, was adjudged leg-before for a duck. Mulla gave a simple catch in the next over, and Canada were in trouble at 28/3. Surkari and Bagai set about the task of re-building the innings positively, with Surkari striking three confident fours, and Bagai hitting a huge straight six. After 18 overs Canada were 75/3. They had taken the score to 90 before both fell in quick succession, Surkari (33) playing on to Haq, and Bagai stumped, beaten in the flight by debutant Lyons. Canada were 96/5 after 24 overs. Dhaniram, who has played only a minor role in the series so far, took charge, and well supported by Keshvani kept the scoreboard ticking. He advanced to an excellent half-century from 55 balls, and with 11 overs to go, Canada were 175/5. Keshvani (17) was unluckily run out when a drive from Dhaniram was deflected onto the stumps by the bowler- he had played an invaluable part in the partnership of 81 in 93 balls. Dhaniram looked to accelerate as the innings wound down and had reached 92 from 86 balls before he was caught in the deep with just 4 overs to go. Some late hitting from Chohan (35*) allowed Canada to reach 250, losing 9 wickets in the process. A brilliant piece of fielding by Baidwan got Canada off to a great start- Hamilton played the second ball of the innings and a dive followed by a direct hit resulted in Watts being run out without facing a ball - quite a contrast to Scotland's opening partnership the day before that laste 40 overs. Osinde made the next breakthrough, having Poonia caught at square leg, with the score on 36 after 6 overs. This brought in Watson to join Hamilton and the pair put together a solid partnership, taking few risks but keeping well up with the run rate required. Hamilton brought up his half-century in the 23rd over, and the partnership had reached 96 before Chohan made a much needed breakthrough, inducing Hamilton (59) to give a catch to Bagai at cover. Canada, USA and Bermuda each won easily on the second day of the ICC Americas Under-19 Qualifier, but the heat turns up in Wednesday’s third round of matches as USA and Bermuda go head-to-head. Americas top two will advance to September’s Global Qualifying competition for places in next year’s Under-19 Cricket World Cup. Canada dismissed Bahamas for 118, then saw opening bat Hiral Patel strike his second unbeaten half century of the tournament. Patel made 71 (9 fours, 1 six) to lead Canada to a nine wicket win. He also took two wickets for 27 runs and was named Man-of-the-Match. Spinner Nitish Kumar took three wickets for 18 and Riayzhan Pathan two for 19 in the Bahamas innings. Orlando Stuart, who scored 31 runs, provided the main resistance to the Canadian bowlers. Canada plays Argentina on Wednesday then closes with key games on Friday against the USA and Saturday against Bermuda. Ryan Corns powered to 58 not out (8 fours, 2 sixes) and Henry Wardley made 37 not out (5 fours) as the USA stormed to a nine wicket win against Argentina. Talha Zamir topped the US bowling with four wickets for 21 runs as Argentina was bundled out for 116 inside 34 overs. Alejo Tissera notched 35 for the South Americans. Regino Smith, with 34 runs, and Deunte Darrell, with 33 runs, headed the individual scoring as Bermuda reached 218 for 9 wickets in 50 overs against the Cayman Islands. Joshua Gilbert then headed the Bermudian bowling with three wickets for 25 runs as the Cayman Islands tumbled to 103 all out. Canada hope the return of captain Ashish Bagai can help them show their quality against Scotland as the two sides switch to the one-day international format. There is a feeling of disappointment within the Canadian camp following the 29-run defeat in the four-day Intercontinental Cup match. There was unhappiness at losing the game, but what hurt more was the poor batting display in the two innings. Despite struggling with the bat they still pushed the Scots hard before losing by 29 runs, but the return of Bagai, who missed the game due to work commitments in London, has fuelled the confidence of the players. Wicketkeeper Ashif Mulla said: “The four-day match was a bad result for us, but one we cannot dwell on. “We must put it behind us and focus on the one-day matches where we hope to do well. “We are looking at batting better in the ODI’s than we did. We did not bat well and want to show the true Canada. “We can play much better and had we stayed in a little bit longer it would have been a tighter game. We lost our wickets too easily, but we are confident we can win these two games. Uganda-born medium-fast bowler Henry Osinde believes the one-day game will bring out the best in his side and is determined to impress against Gavin Hamilton’s team today and tomorrow. He said: “It is going to be a challenging couple of days for both teams. Both Scotland and ourselves are geared up to play one-day cricket. It’s a different game, a different mindset and we are ready. “We want to come back firing on all cylinders and win the two games. “The four-day game was up and down and could have gone either way. We had the initiative, but we didn’t do enough to get the win which is disappointing. “This Scotland team is a very young and inexperienced one, but they played well and deserved to win. “It was our first four-day game in eight months and it showed as we were very rusty and the match took its toll on us physically. Osinde, 30, only took up the game 13 years ago by accident and he admits he is surprised to be playing international cricket. He said: “I was playing volleyball and basketball until I was 17, but when I went to college in Uganda cricket was the most popular sport. “When we finished our studies each day everyone went outside to play cricket so I decided I would try it and I found I was good at it. I’m a natural. “I finished university and thought my cricket career was finished. I planned on finding a job in Canada and try to start a new life there, but I found they were playing club cricket there and they had some good cricketers. “I’ve been in Canada for a while now and it was great to qualify to play for the national team. On a day that saw batsmen dominate, a superbly paced run chase led by a superb century from Jyoti and an unbeaten 92 from skipper Bagai saw Canada overhaul an intimidating target of 287 set by Scotland in the one-day international in Aberdeen. Scotland's total was built on hundreds from Watts and captain Gavin Hamilton who combined for Scotland's biggest ever partnership in one-day internationals. The start was delayed, due to a wet field following heavy overnight rain, but when Canada won the toss, they asked Scotland to bat. Scotland had former Test player Gavin Hamilton returning as captain but were without pace bowler McLeod, withdrawn due to doubts about his action expressed by the umpires of the InterContinental Cup match. Canada also had a new skipper, with Ashish Bagai able to join the team. The Canada team was Rizwan Cheema, S Jyoti, ZE Surkari, A Bagai*, AA Mulla†, S Dhaniram, Khurram Chohan, S Keshvani, U Bhatti, HS Baidwan, and H Osinde. Hamilton and Watts got Scotland off to a good start, despite some hostile bowling from Osinde. Watts got off the mark with a splendid straight driven six off Bhatti, and after 12 overs Scotland were 49/0. Bagai tried different bowling combinations- 7 different bowlers in the first 20 overs- to no avail, and the hundred went up without loss after 22 overs, Watts completing his half century from 52 balls. Hamilton soon followed, his fifty coming from 88 balls. Canada restricted boundaries through defensive field settings but the Scots kept the scoreboard ticking over at 6-7 runs/ over with easy singles and twos. The Scots went from the 15th to 34th over without finding the boundary rope until Hamilton slogged Jyoti (the eighth bowler) for a four. Watts hit Baidwan for a four and a six in the next over, and the Canadian fielding started to flag- Hamilton was dropped twice from hard chances. Watts reached an excellent hundred from 105 balls (his first in List A limited over games), and with 11 overs to go, Scotland were 196/0. Canada finally took a wicket when Watts was superbly caught at cover from Bhatti's bowling - the opening partnership lasting 40 overs and amassing 203. Hamilton went on to his century off 137 balls. Poonia contributed a rapid 22 before lofting a catch to Jyoti from Chohan's bowling. Stander was run out shortly afterwards - after being hit by Hamilton's straight drive, and next ball Hamilton went- a top-edge to third man gave Chohan his second wicket. The only bowler to emerge with credit was Osinde who bowled just 5 overs, conceding 13 runs. It took Canada 40 overs to take a wicket- it took Scotland 4 balls, as Mulla was judged to be lbw to Stander from the first ball he faced. Canada could not afford to consolidate however, and Cheema went, as usual, onto the attack, pulling Stander for six, and hitting Drummond for consecutive fours. Jyoti was also looking for quick runs and the 50 came up in the 8th over. Cheema had made 47 from 38 balls when he mistimed a pull shot, skying a catch to Poonia - he and Jyoti had put on 83. Surkari made just a single before being perhaps unfortunate to be given leg-before. Bagai joined Jyoti and together they took the score to 135/3 with half the overs gone. The hundred partnership was reached in the 36th over, and Canada needed 100 runs at just more than a run/ ball. Bagai passed 50 from 79 balls, and Jyoti completed an excellent century from 110 balls- a major achievement for a player whose previous best score for Canada in all cricket was 47. He took his score to 117 before a fine catch by Hamilton ended a superb innings and a partnership of 146 with Bagai. Canada were 235/4, needing 52 runs off 45 balls. Dhaniram faced one ball before rain intervened, and the players went off with the game nicely poised- Canada fractionally ahead on Duckworth-Lewis. The shower was brief, and play soon got under way again. Bagai hit a boundary with his favourite cut shot, Dhaniram contributed another four, and the pair got away with some risky singles, the Scots missing two run-out chances as tension mounted. The field was brought in to prevent easy singles, and Bagai capitalised, with three boundaries from the 45th over- a cut, a cover drive and a clip through mid-wicket, 14 off the over, bringing the target down to 23 from 30 balls. That over proved crucial, and Bagai and Dhaniram steered Canada home with 8 balls to spare. Bagai was unbeaten on 92 from 112 balls and will be well pleased with the win. There were big wins on opening day for the three teams expected to contest for the top two places in this week’s ICC Americas Under-19 Qualifier: Canada, Bermuda and the USA. The Americas top two will progress to the Global Qualifying tournament where places in next year’s Under-19 Cricket World Cup will be up for grabs. Day one saw Canada power to a ten wicket win over the Cayman Islands. Bermuda won comfortably by eight wickets against Argentina and the USA thumped Bahamas by 250 runs. Pace bowler Arsalan Qadir took three wickets for 26 runs and the Caymanian innings later tumbled as Zain Mahmood took four wickets for 3 runs. Canada’s innings began before lunch. Any doubts over the outcome dissolved as Hiral Patel struck four boundaries in the first over following the lunch break, on his way to an unbeaten 53. The USA began well with a first wicket partnership of 82, before Abhijit Joshi fell for 29. Opening partner Henry Wardley went on to make 73. Greg Sewdial struck 57 and the runs flowed to the end of the innings in a total of 325 for nine wickets from 50 overs. Bahamas was then made to struggle for runs, battling away to reach 75 all out in the 35th over. Argentina struggled to reach 89 all out against Bermuda. Chris Douglas took four wickets for just 4 runs to bring the Argentinian innings to a sudden end. Douglas had impressed last year with two half-centuries in senior ODI matches, but was one of two wickets to fall as Bermuda completed a solid win, reaching 93 for 2 wickets in the 14th over. Play continues on Tuesday when hosts Canada meet Argentina. The key games in the tournament are expected to be USA-Bermuda (Wednesday), Canada-USA (Friday) and Canada-Bermuda (Saturday). But weather interventions and special individual performances from players in the less fancied team could be factors that tilt the eventual outcome. The top two places are decided from the round-robin standings. York Regional Transit (YRT) bus 88, which begins at Finch subway station in Toronto, serves the ground on Mondays thru Saturdays. For those in Toronto without a car, the York Regional Transit (YRT) bus 88, which begins at Finch subway station in Toronto, serves the ground on Mondays thru Saturdays. NSCA (325/5 in 35 overs) defeats PEI (78/10 in 27.2 overs) by 247 runs. NSCA continues its winning run by putting up a massive total of 325 runs for the loss of 5 wickets against PEI in 35 overs. PEI won the toss and chose to field first and from the 2nd over of the innings the runs started flowing. NSCA openers maintained a run rate of 10 runs per over for first 8 overs. First wicket to fall was Vishal Bhardwaj (44 runs) at 95 in the 11th over & Naved Malim walked in at crucial no 3 position. Second wicket partnership was a small one as well, as Arslan Ijaz departed for a score of 37 when the NSCA’s score was 118. Arslan had kept most of the strike after the fall of first wicket but once Arslan had left Naved opened up his season with a bang. Naved & Shashi put together 91 runs for the 3rd wicket partnership, of which Shashi had only scored 9 runs. It was Naved’s show till the end of the innings, scoring 125 runs in 59 balls including 10 massive sixes and 8 fours. It was continuous assault on PEI bowlers as Naved scored his 50 off 27 balls and reaching 100 off 46 balls, when Naved finally fell at team score of 276 Lucky Pareek (33*), Anirudh Muralidhar (20 in 14) & Matt Webb (3*) took the innings to 325. So brutal was Naved’s innings that PEI started shell shocked. Chasing 325 in 35 overs they lost 2 wickets in 3 overs with the score of only 4 runs. From there wickets kept falling at regular intervals, NSCA maintained a much disciplined line which was evident as 9 out of the 10 wickets were Bowled out or LBW. NSCA now heads to PEI for the first away game of the season on July 12th. NSCA will also be sending a second team to New Brunswick for a friendly match on July 11th & other matches scheduled are NSCA vs 2 Navy warships (HMAS SYDNEY & HMAS BALLARAT) visiting Halifax from Australia on July 14th & 15th. It has been a dream start for me and I am delighted to have contributed to my team’s success in the first match of the tournament. It’s always important to start on a winning note and I am delighted to help my team have achieved it,” said Drummond. “It was time for me to take more responsibility with the bat and build partnerships so that we could give something to our bowlers to defend. It was all about staying at the crease because we had a long batting line-up and we knew if we managed to hang in there, we would be able to post a respectable score on the board,” said the fast bowler, who also took 2-22 in the first innings. Reflecting on the conditions, Drummond said: “I think the conditions were good for cricket. And if 39 wickets fell in three days, it was more due to a combination of lack of discipline by the batsmen and quality bowling by the bowlers than terrors on the wicket. “It was an exciting game and I am proud of my team which showed character, stayed calm and stuck to basics. However, I do believe both the sides were a bit rusty and as all the teams in the tournament are almost of equal strength, it will be down to be how quickly the teams can adapt to the given conditions and deliver winning performances. Despite losing the close match, Canada captain Umar Bhatti was upbeat and satisfied with his side’s performance. “I think we played reasonably good cricket. Yes, our batting let us down but overall we showed a good account of ourselves,” said the fast bowler who took 2-67 in the match. “The batting was a bit rusty as we were playing our first four-day match after a long time and the batsmen found it hard to switch from the one-day mode to the longer version. The batsmen tried to play too many strokes when the need of the hour was to occupy the crease and stay in the middle as long as possible. “Despite our batting failures, I think we can draw a lot of positives out of this match. The fielding was top class as we held everything that came our way except for one catch while the bowling of Khurram Chohan was outstanding. “As far as I am concerned, Khurram was the player of the match. He was very unlucky to miss out on a 10-wicket haul. He used the new ball very intelligently and severely tested the batsmen all through the match by bowling in the corridor of uncertainty,” Bhatti said. Chohan, the 29-year-old who has played first-class cricket in Pakistan and has also represented Pakistan at the U/19 level, followed up his 6-37 in the first innings with 3-50 in the second for match figures of 34.4-13-89-9. Bhatti confirmed it was his team’s batting rather than the conditions that led to the defeat. “I agree that the conditions favoured the bowlers more than the batsmen but that doesn’t mean conditions were difficult for batting. “I think some of the batsmen showed that runs could have been scored if they had applied themselves, showed a little more caution and selected the right balls to play their strokes. “When lots of wickets fall in a match like this, a partnership is always waiting to happen. Scotland managed to put together two handy partnerships of 83 runs and 69 runs while our best partnership of the match was 64 (in the second innings). I think if we had managed to produce one more partnership of 50 odd runs, the result of the match might have been different,” said the 25-year-old Bhatti. Sandeep Jyoti's 47 and a stalwart's innings from Geoff Barnett nearly took Canada to an impressive and unlikely win on the third day against Scotland at Aberdeen, but Callum MacLeod and the rest of his side held their nerve to record a 29-run win in the first match of the 2009-10 ICC Intercontinental Cup. Canada were set 243 to win after Scotland's innings ended on 199 yesterday evening, and the home side continued their dominance of the match by picking up four early wickets. Jan Stander, whose 64 yesterday was so crucial, had Trevor Bastiampillai caught in the slips, as was Qaiser Ali who edged Callum MacLeod for just 3. When Sunil Dhaniram offered a simple return catch to the economical Richie Berrington, Canada had stumbled to 60 for 4. But a renaissance took place between Jyoti and Khurram Chohan, the pair putting on 64 for the fifth wicket. With plenty of time left to reach their target, caution was the watchword for both players, but Jyoti did seize on anything too full, driving Berrington for a handsome four through the covers and hammering MacLeod through the same region, this time off the back foot. Jyoti was much less assured against Mo Iqbal, however, edging a classical legspinner's delivery straight to first slip to hand Scotland back the momentum. Barnett found support from Ashif Mulla (27) with a stand of 42, and put on a ninth-wicket stand of 23 with Shaheed Keshvani as Canada's dressing room all began to cheer in support, anticipating an unlikely victory. With the excitement came tail-end nerves, however, and a horrible mix-up between the pair cost Keshvani his wicket, run out by a combination of Berrington, Haq and Ryan Watson. Forty-five runs were required; one wicket remained. Henry Osinde did what he does best, smashing Haq for a six, but MacLeod returned with the old ball and produced a pearler that left Barnett late, clipping his off stump, to record a very tense Scotland win. Canada face a tough test on the third day of the Intercontinental Cup match against Scotland in Aberdeen. They needed 243 to win, on a pitch that had so far seen 29 wickets fall for an average of 18 runs apiece. Time was not an issue, with 2 days remaining. Bastiampillai opened the batting with Barnett who looked in excellent form hitting three boundaries. The score was on 22 when Barnett was forced to retire hurt with back problems - a major blow to Canadian hopes of victory. 3 balls later Bastiampillai fell, caught by stand-in keeper Watson, bringing in Qiaser Ali to join Jyoti. Things got from bad to worse when Qaiser Ali, with a track record of playing long innings, gave Watson yet another catch behind - 33/2. Eventually a brave effort fell just 30 runs short- Canada's total of 213 was the highest of the match. Jyoti (47), Barnett (bravely returning after injury) (31) and Keshvani (34) made significant contributions but Canada needed a major innings from someone. After another day when the batsmen struggled another lower order partnership from Scotland has allowed them to set Canada 243 to win - an intimidating task on a wicket that has helped the bowlers throughout. Canada resumed at 105/7, still 77 behind Scotland after a first day when 17 wickets fell. Scotland were without 'keeper Simon Smith, who had injured himself in pre-match practice - Ryan Watson took the gloves. Bhatti hit the first ball of the day for four, but was lbw to the pacy McLeod two overs later. Cheema (35) was still there, batting with more restraint than usual but then he edged Stander to the stand-in keeper Watson who was delighted when he comfortably took the catch- 121/9. Chohan (23*), well supported by Osinde, and helped by a little luck, took the total to 142 before Osinde fell lbw to give McLeod his 4th wicket. Canada had to wait until the 9th over for their first wicket of the day, when Bhatti had Iqbal caught at 2nd slip. A double bowling change just before lunch reaped dividends when Watts was caught behind off Chohan; and Watson mistimed a pull to mid-wicket off Cheema - 31/3. One run came in 5th overs after lunch, and the tight bowling paid off as McCallum edged Chohan to Mulla- the 8th dismissal of the match for each of them. Berrington and Chalmers took the score to 67 before Cheema bowled Berrington. Cheema took his 3rd wicket when Chalmers was caught by Mulla for 24, and Scotland were 77/6 with Smith unable to bat. Stander and Haq are currently providing some resistance, and Scotland were 96/6 at tea. Canada needed quick wickets to polish off the tail, with Scotland only 139 ahead at this point. The 7th wicket fell in the first over after tea, when Chohan had Haq caught by Qaiser Ali at slip, but the final two wickets proved elusive as for the second time in the match Stander and Drummond defied the Canadian bowling. They put on 69 before Drummond (34) gave Mulla yet another catch. Stander (64) reached an excellent half-century on his first-class debut, and when he was finally out, Scotland had reached 199. Chohan had taken 9 wickets for 86 in the match, and Mulla had an outstanding performance behind the stumps taking 9 catches in all. There was no time for Canada to bat, but Scotland must be strong favourites at this point. With the acceptance of Ben Sennik’s retirement effective July 1st, 2009 Cricket Canada is pleased to confirm today that first vice president Ranjit Saini will assume the duties of President. In accordance with the constitutional requirements of Cricket Canada, Saini will assume the duties of President until the Annual General meeting or sooner should the Board of Directors take steps to elect a new President. Six Canadians have been honoured for their outstanding contributions to Cricket in Canada by the International Cricket Council at the recently concluded Centenary week in London, England. The Canadian recipients of the ICC Centenary Medals are Calvin Clarke, Clifford Cox, John Davison, Geoff Edwards, Jack Kyle and Martin Vieira. Edwards and Kyle are both past presidents of Cricket Canada. Edwards presided over Canada’s 2001 World Cup qualification run and saw the team into the 2003 Cricket World Cup where Canada achieved its first and only win against a full member country. Kyle has been a stalwart of British Columbia Cricket for a half century and his work especially with junior cricket has been an unparalleled success. Martin Vieira is the current Regional Development Manager for the ICC America’s region but was a long time member of the Cricket Canada executive as well as holding various positions in Ontario and Toronto. Cricket Canada is extremely proud of these Canadians and is grateful for their contributions. Canada's Intercontinental Cup campaign opened today in a sunny Aberdeen. CricInfo has a live scorecard. A fine Canadian bowling performance, led by Khurram Chohan's 6 wickets had Scotland all out for just 185, but the Scots fought back, reducing Canada to 108/7 at the close. 17 wickets fell in the day on a pitch that provided the seamers with considerable assistance. The majority of wickets fell to catches in the slips or by the keeper. Both teams failed to bat with the discipline required in four-day cricket in somewhat difficult conditions. Scotland won the toss and chose to bat. The Canadaian team was U Bhatti*, Rizwan Cheema, Qaiser Ali, GEF Barnett, TC Bastiampillai, S Jyoti, S Dhaniram, S Keshvani, Khurram Chohan, AA Mulla†, and H Osinde. Canada got off to a good start when Bhatti trapped Iqbal leg before in his second over, with the score on 10. Tight bowling from Osinde and Bhatti paid dividends when Watts edged a catch to Mulla behind the stumps- 44/2. Bhatti bowled an excellent 8-over spell conceding just 18 runs. Chohan replaced him and showing a good turn of speed first hit, then bowled Berrington in his first over - 55/3. Osinde took the next wicket - that of the in form Ryan Watson - caught behind for 37, then with the score on 78 Khurram Chohan dismissed McCallum to a great catch by Qaiser Ali at second slip, and next ball nipped one back to have Stander leg-before. Scotland were 78/6 at lunch. Chohan took his fourth wicket when debutant Chalmers edged a catch to Mulla, and Scotland were in deep trouble at 93/7. Mulla took his fourth catch off Cheema, but then Scottish skipper Drummond and Simon Smith mounted the best partnership of the innings. Drummond's previous best score in 16 List A and first-class matches was 25, but he sped past that and by tea had reached a maiden first-class half-century, with Scotland at 175/8. Chohan's return brought the breakthrough Canada needed, as Drummond top-edged a cut to Mulla- his 5th catch and Chohan's 5th wicket. Drummond had batted well to put on 83 with Smith and gave the Scotland total some respectability. Chohan wrapped up the innings with his 6th wicket 2 balls later, McLeod being adjudged lbw. His final figures were an impressive 13.4-5-37-6. Canada had most of the final session to bat on a wicket that definitely provided some assistance to seam bowling. Their hopes of a big total received a blow when in the course of 2 overs they lost both openers, plus Bastiampillai for a 2nd ball duck, leaving them on 23/3. Mulla responded by smashing the first two balls he received for four, but then settled down to re-build the innings with Qaiser Ali. They added 24 before Mulla was caught at slip, and then Dhaniram smashed three boundaries before being caught at slip for an 8 ball 12. Drummond, who was having a very good first day as national captain, picked up a second wicket when Qaiser Ali was caught behind. Canada were 62-6 with a first innings lead a distant prospect. Cheema and Keshvani (18) put on 34 before Keshvani went for a big hit with just two overs left in the day, and was bowled. Canada trail by 77 runs with just 3 wickets remaining, Cheema still there on 21 (from 13 balls with three fours and a six). TORONTO — Umar Bhatti will lead Canada against host Scotland in Aberdeen on Thursday to kick off the 2009-10 ICC Intercontinental Cup cricket tournament. Bhatti stands in for regular skipper Ashish Bagai, who is unavailable to play because of work conflicts. John Davison and Ian Billcliff have also had to pass on the European tour. Ashish Bagai (capt. ), Umar Bhatti (vice-capt. ),Qaiser Ali, Harvir Baiwan, Geoffrey Barnett, Trevin Bastiampillai, Rizwan Cheema, Khurram Chohan, Sunil Dhaniram, Sandeep Jyoti, Shaheed Keshvani, Ashif Mulla, Henry Osinde, Abdool Samad, Zahir Zameer. Ramon Lachmansingh is scouring the web for us to give us regular updates on league standings from round the country. Here's his first submission to mark Canada Day!